Another impromptu local activity for my summertime crew found us braving potential thunderstorm activity to take in a movie at the Harvest Moon Twin Drive-In. As usual, I made the decision to take us there rather hastily. Fortunately, the theater is close enough to town that it can be that sort of last minute option with very little planning – something for which I am very well known. I’m embarrassed to admit that even though I have lived in Champaign since the age of 14 this was my first trip to Gibson City to watch a movie under the stars. I’m happy to say that it did not disappoint. Looking for a fun night for the entire family just a short drive from Champaign-Urbana? 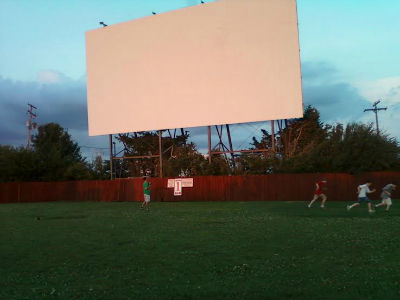 The Harvest Moon Drive-In Theatre in Gibson City might be just what you are looking for! Photo Provided. In a nutshell, it was fantastic. My kids – all three of them! – hooked up with other kids and played football, tag and all other sorts of actual, real outside games while girls turned cartwheels and walked around in pairs giggling at the football playing boys. The owner drove up on his golf cart and chatted with us for a bit, a very friendly guy and a lot of fun. He even took my younger two around with him while he was out making the rounds – they loved it. The whole place had a very relaxed, friendly atmosphere. We only brought a small bag of snacks with us, but other patrons feasted on full picnic spreads that they laid out on the small picnic tables scattered throughout the parking area. If you’d rather let the snack bar feed you, be sure to line up well in advance of the start of the show. They have a lot to choose from and the line was pretty long. Bringing in your own food is the way to go for a family though – at just $5 for a food permit and with the ticket prices actually less than those at the regular theaters; it’s the best deal around. Planned in advance or thrown together at the last minute – either way, it’s worth the effort. • Bring chairs for those who don’t want to sit on the ground or in the tailgate. They do have picnic tables, but not one for every single parking spot. • Remember the bug spray and use it liberally- I’d say this is probably the single most important item we brought. • Pack the football, baseball gloves, Frisbees and soccer balls. There’s a big field for playing and general fun in front of the screen and your kids will love the freedom of running around in all that space. For the kids who might not do well with all of that free form, sports oriented play, consider bringing whatever keeps them happy for that free time while you’re waiting. • Leave your phone in the car. You’re not going to need it – you’ll be too busy enjoying the quiet and the calm. • During intermission, start your car. You’ll listen to the movie on your car radio at full volume so you want to treat your battery kindly. If your car radio won’t accommodate that, you can rent one from the snack bar. • Be ready for some old fashioned summer fun where your kids can play and the adults can sit back and relax. Harvest Moon Twin Drive-In Theatre: 1175 S. Sangamon Ave., Gibson City (Rt 47 South). Movie Line: 217-784-8770. Office: (815) 268-4000. Open seven nights a week during the summer (Friday-Thursday). Movies are shown rain or shine. Gates open: 6:30 p.m. (Fri & Sat) 7:30 p.m. (Sun-Thurs) Showtime: 8:40 p.m. Admission: Adults (12 & up): $7.00 Kids (4-11): $6.00 Kids under 4: FREE! Only Cash is accepted at the Box Office! Credit and debit cards are accepted in the snack bar or burger barn. Food Policy: There is a $5.00 Food Permit (per car) to bring in outside food or drink. A coupon for $5.00 in the snackbar is attached to each permit.